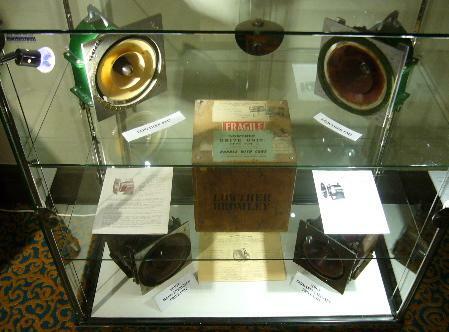 On display in the Hi-Fi News Show ballroom were classic Lowther and Voigt drivers (bottom left is an AC mains-energized field-coil Voigt). 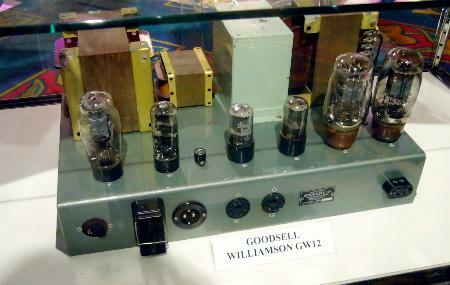 Perhaps the amplifier that had the most influence on modern tube-amp design was the D.T.N Williamson, shown here in an example made by Goodsell of Brighton. 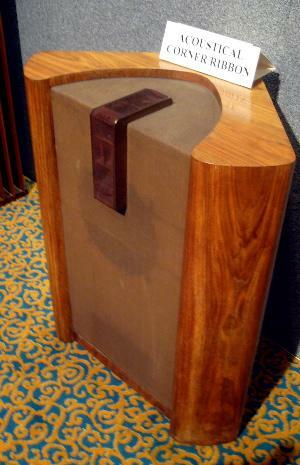 On display in the ballroom at the Hi-Fi News Show: an original early-'50s Corner Ribbon speaker from the Acoustical Company, later to change its name to Quad. A fabulous and fascinating exhibition of classic historic hi-fi equipment made a visit to the ballroom of the Hi-Fi News Show a must. 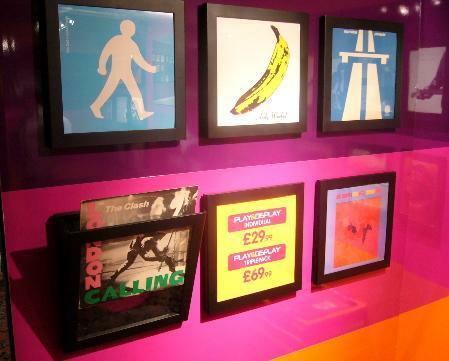 The complete history of Lowther-Voigt seemed to be on display, and a Voigt Corner Horn was actually playing music, from a "vintage" (first-generation) CD player via a compact Pye tube amplifier. 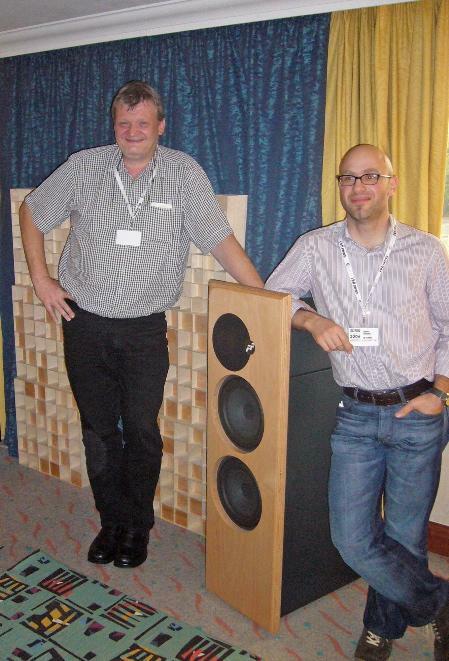 Exceptionally tall speaker engineer Karl-Heinz Fink, and his more diminutive partner Lampos Ferekedis, stand each side of their remarkable prototype BMR technology demonstrator (balanced-mode radiator; see the December 2005 Stereophile). 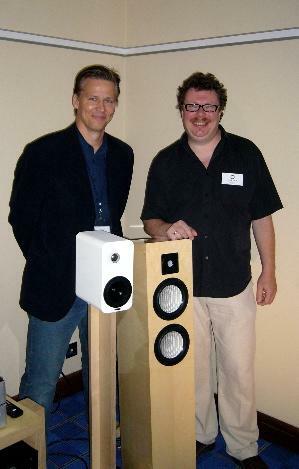 These two, forming a "gang of four" with original inventor Dr Graham Bank and marketing man John Vizor, have licensed the BMR technology from NXT, and the prototype, using a 3.4" BMR unit upwards from 400Hz, via an active crossover, clearly showed the considerable potential of this radical driver, which in effect automatically reduces the radiating diameter as frequency rises. 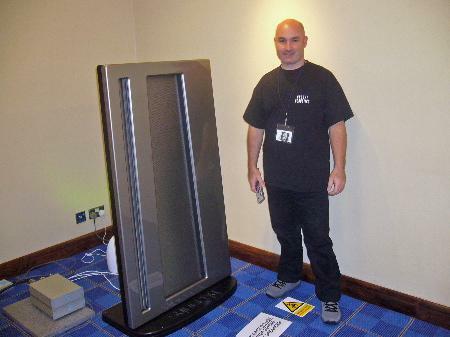 According to the glossy leaflet, the Lizard Wizard on show at the Heathrow Renaissance Hotel is, to quote verbatim: "a PMC amplifier that handles High Quality loudspeakers superior, without the everyday type amplifiers air disturbance [acoustic aliasing distortion]." No I'm not sure either, and the rest of the blurb is similarly opaque. Clearly translating Hungarian into English (or even American!) has its pitfalls, and I didn't get much further chatting face-to-face, either. 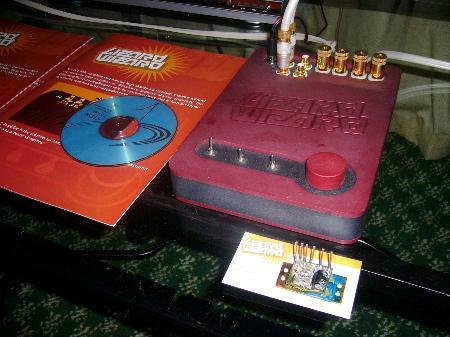 What is certain is that this colourful amplifier looks cute and is incredibly compact—the actual electronics may be seen sitting on the business card just in front. In this case the PMC bit stands for a "ParaMagnetic Current," or virtual-coil amplifier, which is rated at 60Wpc into 8 ohms, but has a specified output impedance of 0–36 ohms. Curiouser and curiouser, as Alice once remarked. Finn Anssi Hyronen (left) and Swede Leif Mårten Olofsson (right), stand with their respective new babies at the Roy Bird Show. 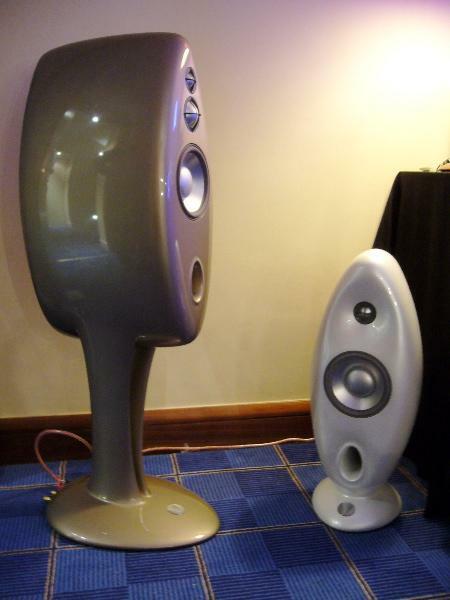 The tiny Amphion Ion (left) not only sounded remarkable for its size, but has also won a valuable design award back in Finland. At ten times the price of the Ion, Mårten's elegant new Miles III floorstander has tapered cabinetwork and costly Accuton ceramic-diaphragm drivers. If the Ypsilon kit is anything to go by, Greece could be about to join the high-end community. 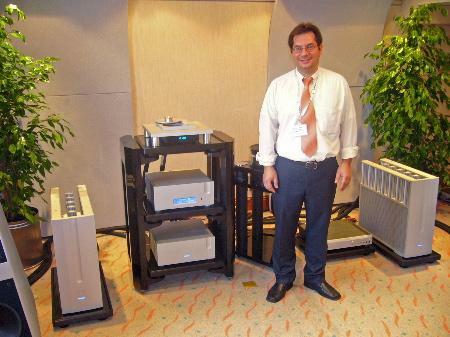 Engineering Director Dimitris Baklavas (pictured at the Hi-Fi News Show) explained that his company has been around for some 12 years, but had only recently developed the sort of products that could take on international High End. Those massively heat-sinked monoblock power amps, for example, use a tube input stage, a class-A MOSFET output stage, and generate around 300W of waste heat each. To reduce the sonic "grain" that is generated by resistors, the preamp has a transformer-based attenuator, the transformer itself having 32 taps and using cotton insulation. 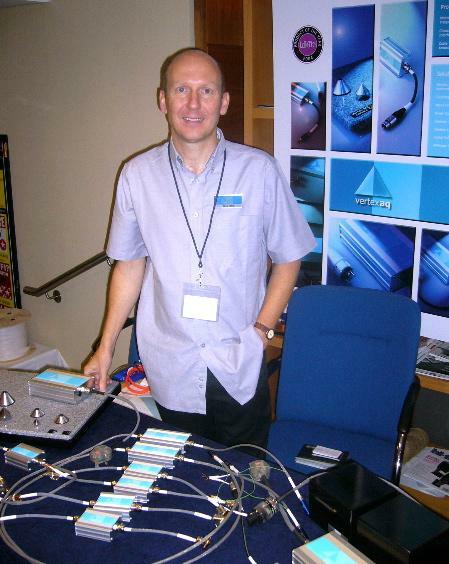 Steve Elford's background in aerospace ultrasonic testing has helped him develop the various Vertex AQ devices. Special support platforms help remove vibrations from components, while the various cables incorporate damping blocks to prevent vibration being passed around the system, as do mains blocks which incorporate parallel RF noise filtering. Vertex were demonstrating their products at the Roy Bird Show. 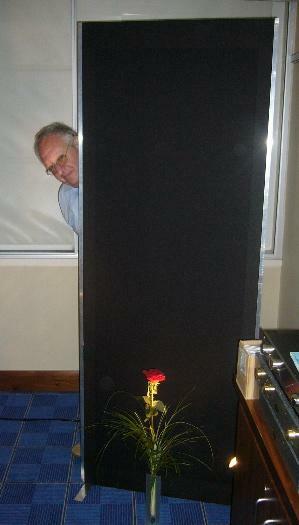 Peeking out from the edge of this gigantic 14ft2 panel at the Roy Bird Show, veteran retailer and audio writer Howard Popeck has taken on this distribution of the Podium 1, and told me that its inventors and makers wished to remain anonymous. Further investigation unearthed the information that Paul Burton (responsible for the early-‘90s Sumo speaker and in part the Cyrus NXT-hybrid design) is involved, and close inspection suggests that a very large NXT panel lies at the core. The good news is that it's only around ½" deep around the edge (with a bulging rib, presumably covering the actuators, down the spine); it will cost a relatively modest £3000–4000/pair with a money-back-if-not-satisfied guarantee; and it delivers a sound with a very generous and convincing sense of scale. Bass might have been tauter (but the room was really much too small for such large panels), and imaging seemed a bit vague (as one might expect), but its ability to generate impressive dynamics was both intriguing and very persuasive indeed. 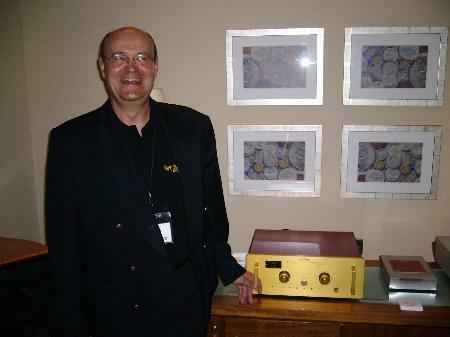 Hervé Délétraz, proprietor and inventor of the rather wonderful Dartzeel amplifiers, and possessor of a great sense of humor, did his best to explain at the Roy Bird Show the operational improvements in the now electronically encoded preamp volume control. Vivid Audio's stylish speaker range, made in South Africa and engineered by ex-B&W designer Laurence Dickie, is expanding. A compact stand-mount (right), available in two sizes with bass alignment for either boundary or free space siting, has now joined the original B1 (left) and larger K1 models. Vivid speakers were demmed at the Roy Bird Show and are distributed in the US by Musical Surroundings.